The year is 1984 and on the rural East Coast of New Zealand Boy (James Rolleston), a dreamer who loves and is inspired by Michael Jackson, lives with his brother, Rocky (Te Aho Eketone-Whitu), a tribe of deserted cousins and his Nan. Boy’s other hero is his father, Alamein (Taika Waititi). Often the subject of his fantasies, Boy imagines his father as a deep sea diver, a war hero and a close relation of Michael Jackson (he can even dance like him). However, in reality, Alamein is an inept, wannabe gangster who has been in jail for robbery. When Alamein returns home after seven years away, Boy is forced to confront the man he thought he remembered, find his own potential and learn to get along without the hero he had been hoping for. Inspired by Taika Waititi‟s Academy Award-nominated short film, Two Cars, One Night, Boy is an absolute movie gem - a coming of age tale that is both extremely funny (infused with wonderful New Zealand humour familiar to Waititi’s films) and also deeply moving. I couldn’t help but fall in love with Boy (brilliantly played by Rolleston) and his misplaced fantasies about Alamein. Yes these delusions trigger many hilarious moments (all superbly realised by Waititi) but, as they help him cope with reality, they also reveal his hidden grief and sadness. It is the balance of these two emotions - laughter and sadness - that makes Boy such an entertaining and satisfying experience. There is certainly much more to this film than a series of silly gags. 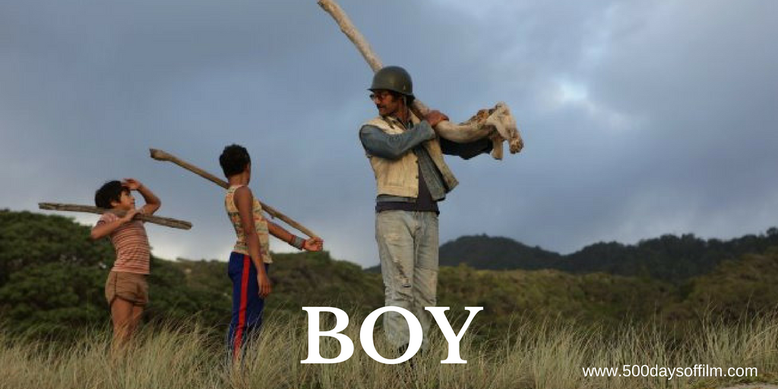 Boy is both a laugh out loud comedy and also a drama that explores the impact of loss (both personal and cultural). A powerful sense of place also allows Boy to explore the contradictions facing its characters. While the area is called “The Bay Of Plenty”, many of its residents appear to hover on the poverty line. The natural world is visually stunning, the man-made world increasingly derelict. While Boy explores such complex and powerful themes, the film's wonderful comedy will have you laughing from beginning to end. “I can't really handle depressing films about depressing subjects,” Waititi confesses. (Dog Day Afternoon), David Benioff (Troy), Naomi Foner (“Running On Empty), and Susan Shilliday (“Legends Of The Fall”). If you have, what did you think of Taika Waititi’s film? Let me know in the comments section below or via Facebook or Twitter (@500DaysOfFilm).